The work enabling Dunkerque LNG customers to take advantage of rapid refuelling service for their tankers is now complete. This service significantly reduces the stopover time when reloading. Nathalie Welman and Didier Gens are both in charge of documentation at Gaz-Opale which operates the LNG terminal at Dunkirk. Their job is not well known, but it is crucial to ensuring that everyone can quickly find the documentation they need to go about their daily work. 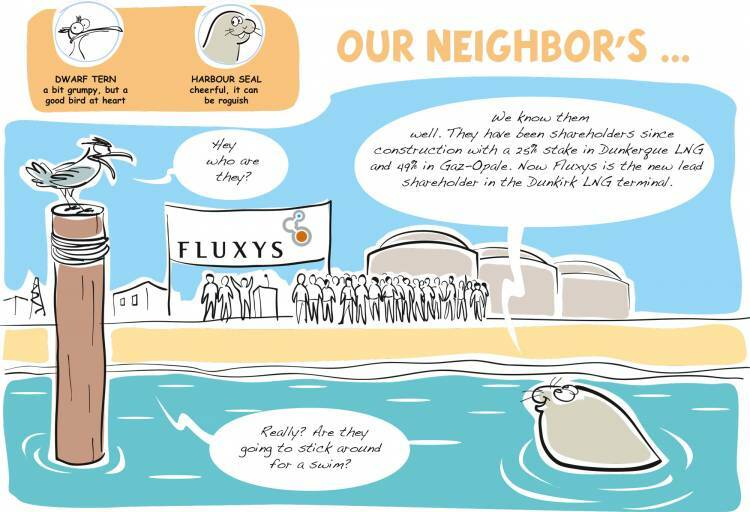 Fluxys, the new lead shareholder in the Dunkirk LNG terminal, meets with the community. For its second year of operation, the Dunkirk LNG terminal saw a sharp rise in results. Pascal De Buck, CEO of Fluxys, the new lead shareholder in the Dunkirk LNG terminal, and Béatrice Prud'homme, Chairwoman of Dunkerque LNG, presented their 2018 results to the region and described their development projects. Number of people who visited the Dunkirk LNG terminal in 2018. Number of ships serviced at the Dunkirk LNG terminal in 2018, or a 70% increase over 2017. Do you want to apply? Meet the HR team at our stand on 3 April! With a reloading flow-rate of up to 8,800 m3/hour, the Dunkirk LNG terminal is now one of the fastest in the world.